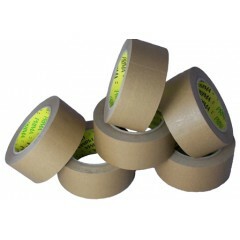 Kraft paper tapes, manufactured in the UK and branded by Prima. A more expensive adhesive solution, but one that is 100% biodegradable and environmentally friendly, giving it an updward push in the market. We are keen to increase distribution of paper tape, given the fact it is such an environmentally friendly solution in comparison to other solvent tapes on the market.